Here we follow the process of making a carving. We started with a logo, included lettering, and determined size and depth of the relief. We then put it on the Legacy. After the logo was finished, we decided it would be a nice accent to create an inset oval surround within a rectangle overall shape with rounded edges. 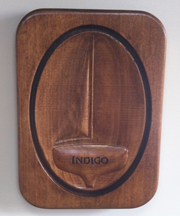 The piece was stained and lacquered to make it look " old and shippy" to match a traditional boat interior. Starting out on the Legacy with a block of wood and a drawing created from a logo.